Over the past couple of years, many people have been reaching out about the project. Asking things like: What type of ink do you use? 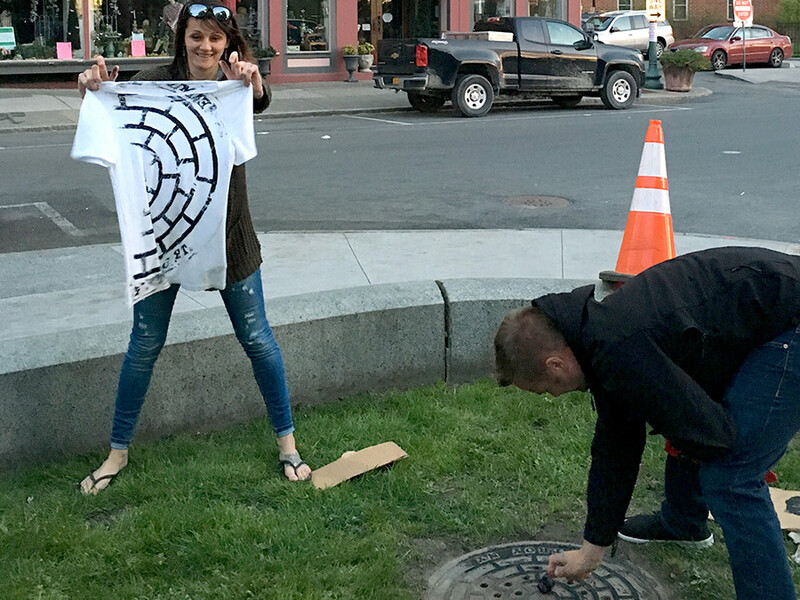 Have you ever been arrested?, What’s your favorite city for manhole covers? How have you not gotten run over by now? Some even say “How much for an original?” That’s the least frequently asked one and the most difficult to answer. 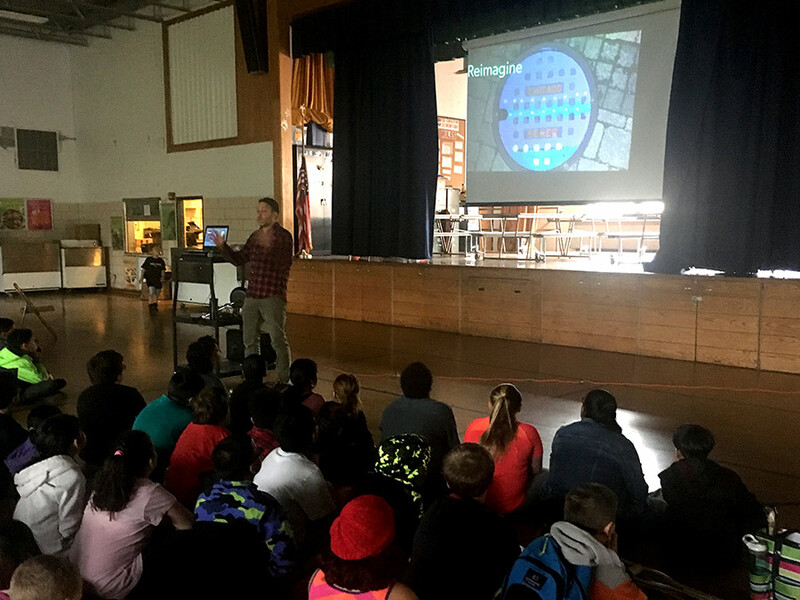 All of the above is a ton of fun, but someone asking if I would come do a workshop with 150 eager and curious 4th graders… that takes the cake. 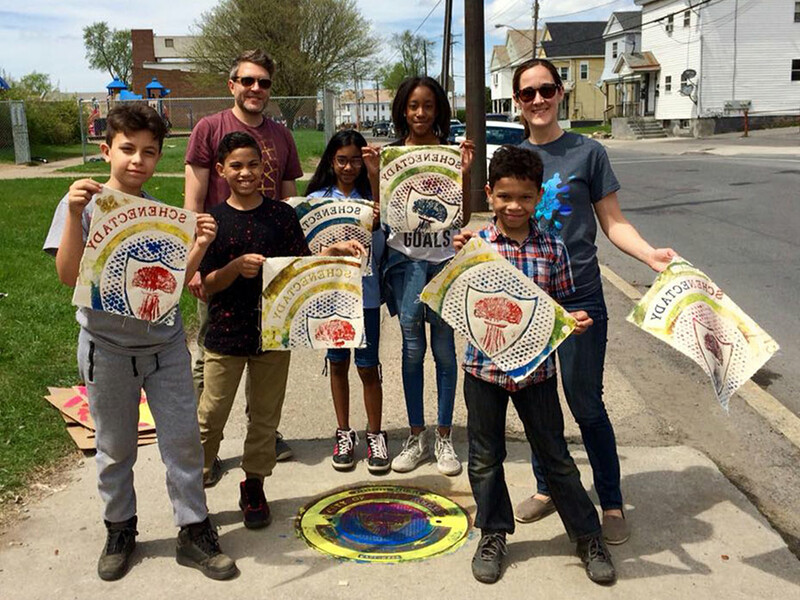 Mandi Coburn from William C. Keane Elementary in Schenectady, NY had read a Newslea article about Storm Print City. 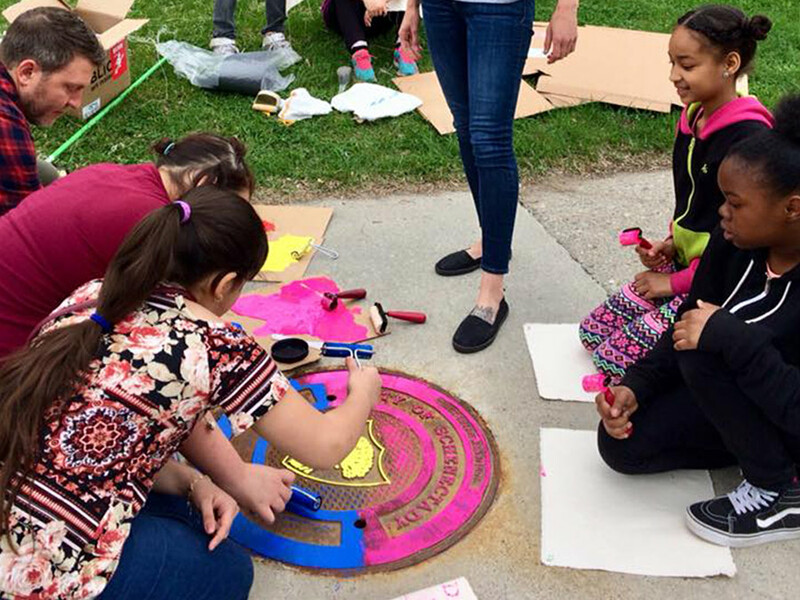 She showed her 4th grade class, and then based a few projects around manhole covers – and they came out awesome! She sent me photos of them which made my day, week, month and maybe my year. It was so cool to see what they created and I was extremely grateful. Fast forward three weeks and I’m landing in Albany on Mother’s Day. I ordered 150 square feet of my favorite canvas and 4 gallons of ink that had already been delivered to the hotel. First thing to do? 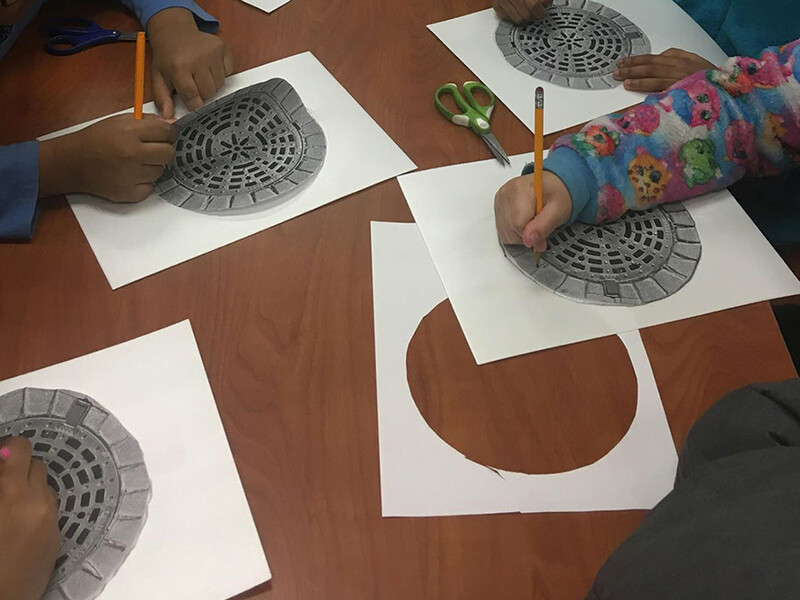 Drive to the state capital building, find a cover, and make a print. It was just as easy as said, maybe even flawless. From there, I headed to Troy, NY (Uncle Sam’s hometown) where I checked in and confirmed the canvas and ink had been delivered. I went to meet Mandi and her rad boyfriend for the first time. They’re both amazing artists, he’s a local fireman, and I learned a lot about the area in a short amount of time. We made casual plans for the next day, and almost called it a night, but then the idea of making a print came up. 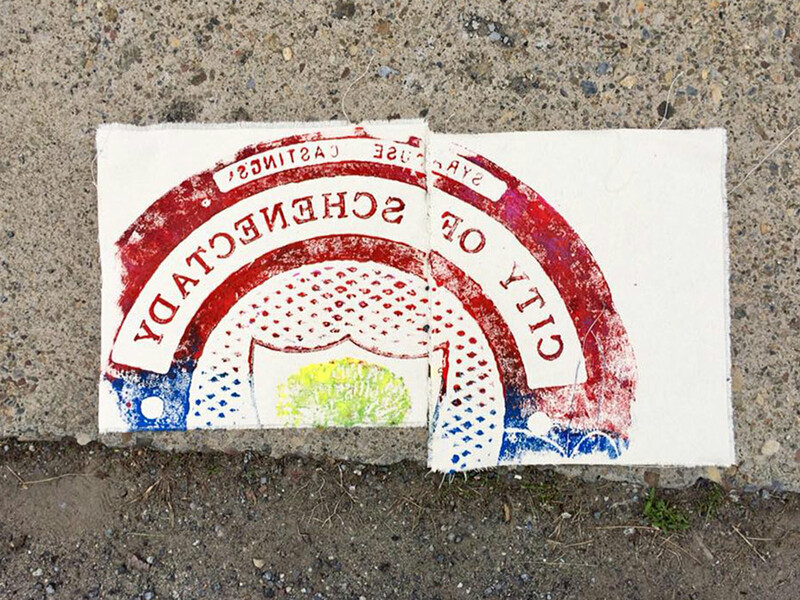 I stuffed some ink and a brayer into my pocket and we walked towards downtown. An hour later, they both made a t-shirt as the sun went down. 5 AM the next day, I’m in the hotel parking lot ripping the canvas into 150 small pieces, grab a coffee, and head to the school. Schenectady is a small city about 15 miles outside of Albany. It’s rich in history, very diverse, and full of hometown pride. 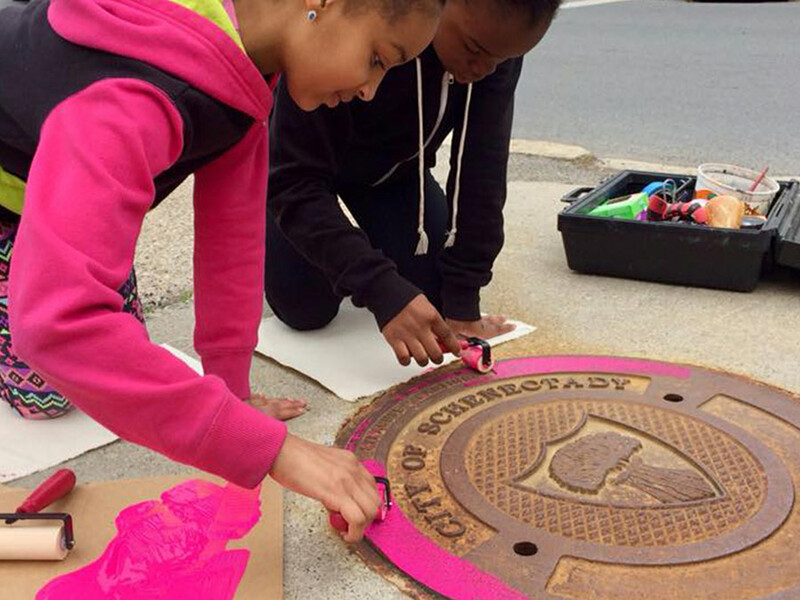 Mandi gave me a quick tour of the school and the manhole cover art they made a couple months back. I must say, it was super cool seeing my name on the board and even cooler how impressive the artwork was that she helped them create. By 8:15, the gymnasium is full of 4th graders from two schools, their teachers, a projector and a screen for a slideshow. 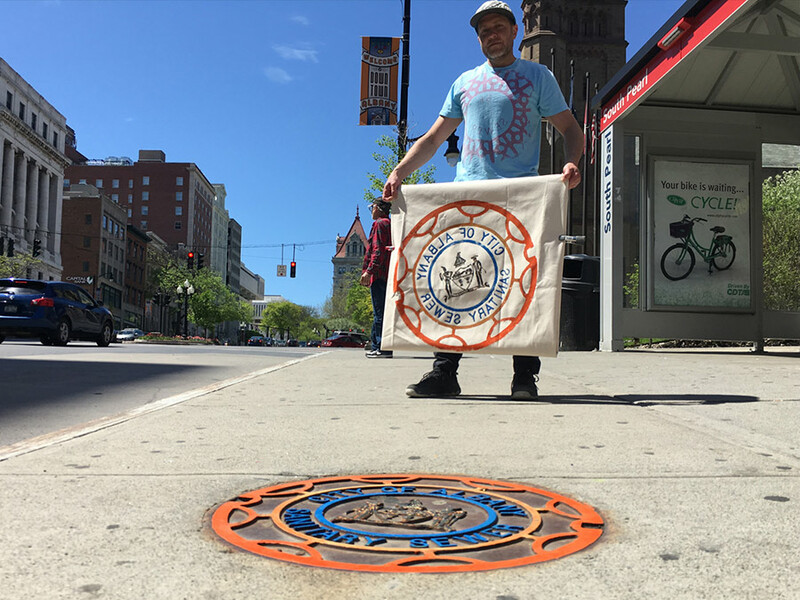 I started out showing a variety of manhole covers from different cities across the U.S. We talked about graphic design, history, messages, and markings. Then, I led into my favorite part – reimagining the covers through colored ink on canvas. I played a 2-minute video showing the process and the room became completely silent. One hundred and fifty 4th graders, as Real Rap Ryan Reynolds would say, all locked in. How old were you when you made your first print? 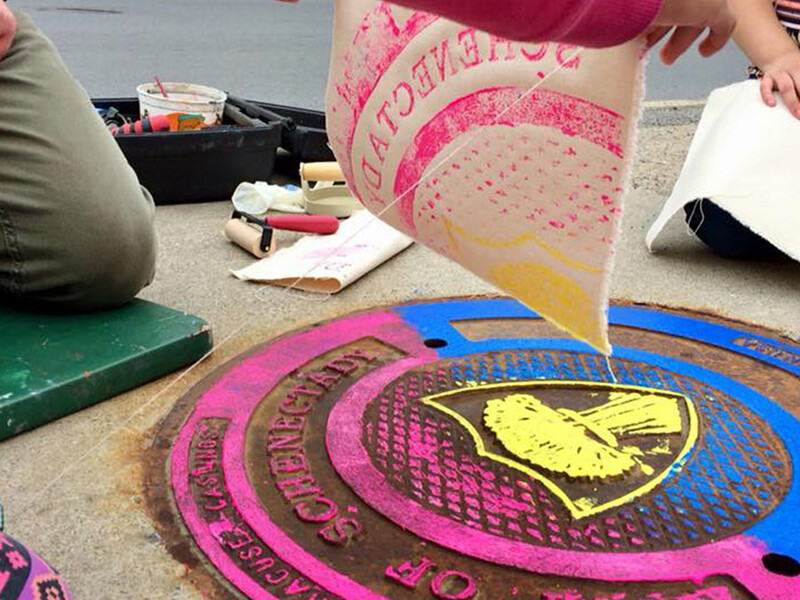 What did your parents say when you told them you wanted to paint manhole covers for a living? Why are you wearing the same outfit in all of the photos? Why is it all black? How long does it take you to paint one? 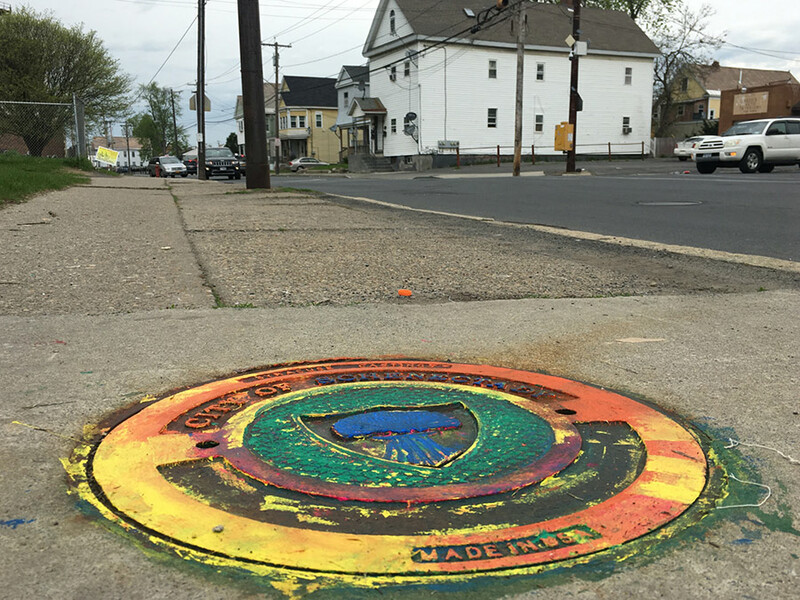 What’s your favorite manhole cover? They were curious, skeptical, and smart. And they hit me with a barrage of well-thought out questions to the point where Mandi had to cut them off. In the very beginning, I asked the group, “who likes art?” I would guess about half raised their hand or made some type of gesture. After showing them the video and talking about the project, I asked, “who wants to make some art?” I’m pretty sure all of the kids raised their hands. Over the next day and a half, Mandi and I managed to pull off about 120 individual prints for each 4th grade student from both schools. They got to choose the part of the cover they wanted to print, give suggestions on the color, press the ink into the canvas, and they all peeled up their own print. It was ink, press, peel, repeat all day and Mandi crushed it. 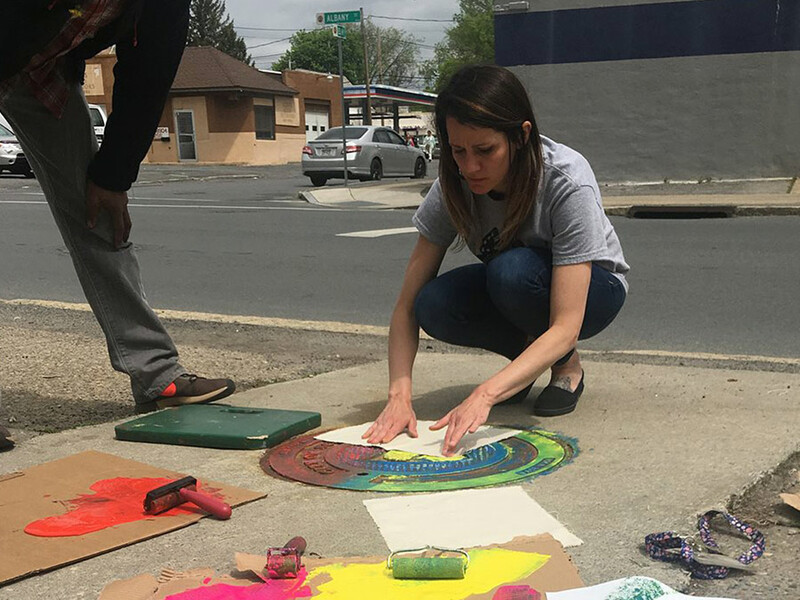 The other art teacher, Heather, was also super awesome at prepping them and pushing their creativity. On my way out of town, I saw a group of kids from earlier in the day. 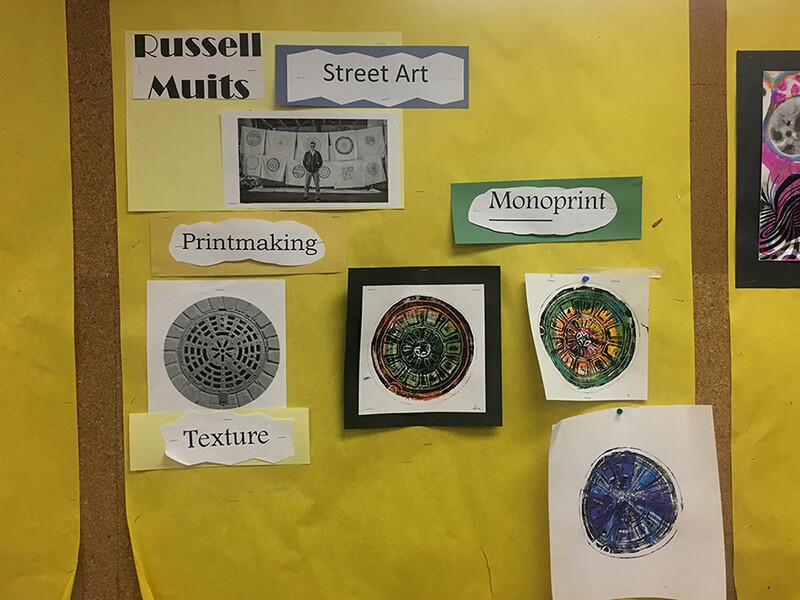 One had his print rolled up in his back pocket, one was sticking out of a backpack, and the last one was showing his print to the crossing guard. I had never heard of Schenectady before Mandi reached out, and after spending the last two days there, I was sad to leave. 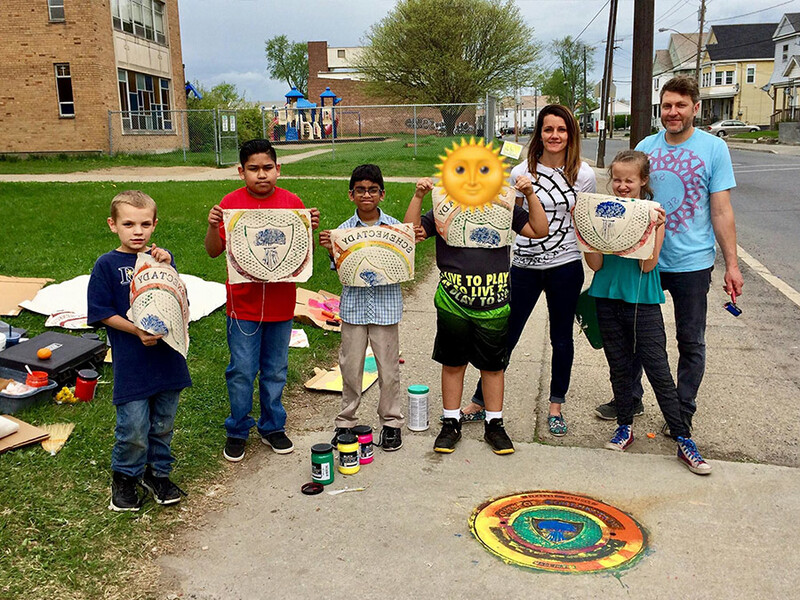 Watching each student as they pulled up their print was special and being able to connect these kids with their community through art was even better. Maybe some will go on to a career in art or design. Maybe some will be inspired by the historical aspect, and maybe some will find their own creative journey in an unlikely place. I would think all of them will look at their neighborhood, community, and hopefully the world, from a new perspective. Big thanks to Mandi, Heather, and Schenectady Public Schools for caring about what you do and for impacting so many young lives in a positive way. I’m pretty sure the three of us were having just as much fun as the students. 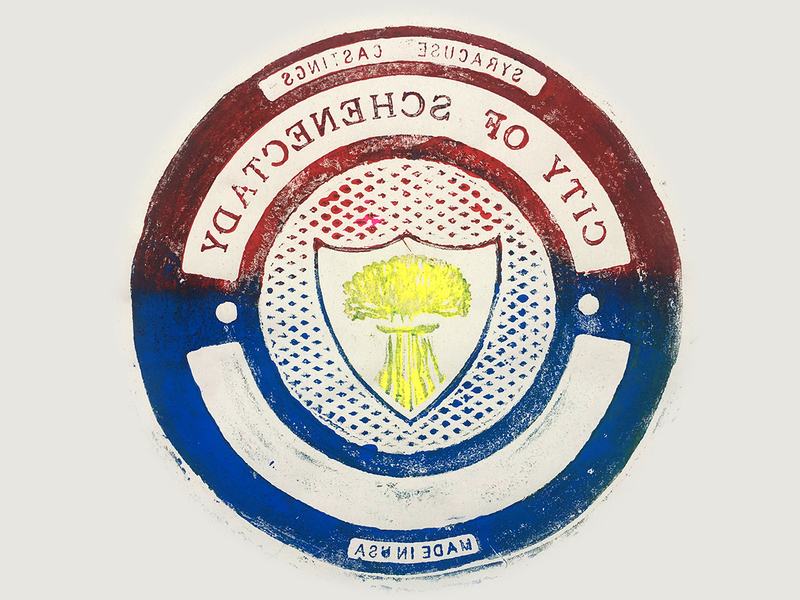 One of the cool things we learned is that the symbol in the middle of the cover is actually broom corn when we all thought it was wheat. You can read about that here. This experience was humbling, inspiring, and a ton of fun. See you again next year!